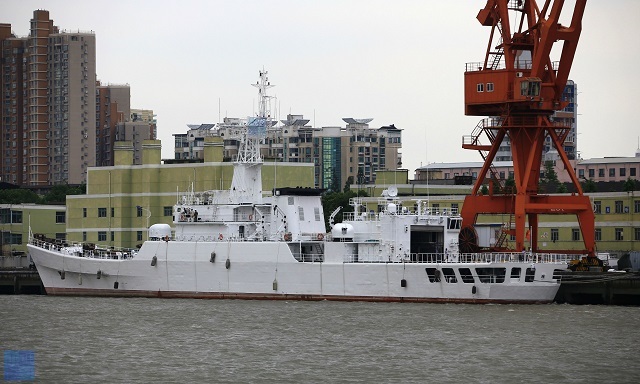 Navy recognition is reporting that all four type 053H2G frigates (NATO designation Jiangwei I) have been transferred to the Chinese Coast Guard, contributing to the already feverish build up of this service. These 115 meter (376 foot), 2,200 ton, 27 knot, helo deck and hangar equipped, diesel powered ships entered service with the Chinese Navy (PLAN) between 1991 and 1994, so while far from new, by USCC standards, they should have considerable life remaining. The design seems quite appropriate for a cutter. The fact that the PLAN is willing to give up these ships suggest both the pace of modernization of the PLAN and the priority given to bulking up their Coast Guard. The conversion apparently results in the removal of all the primary weapons including a twin 100mm gun, anti-air and anti-surface missiles, and anti-submarine weapons. But the ships will not be unarmed, and how they are armed may suggest how Chinese Coast Guard vessels, which were essentially unarmed in the past, may be armed in the future. The guns that remain are four twin 37mm type 76A mounts. Positioned as they are, this will allow at least two twin mounts to be pointed at any direction, and in perhaps most cases three twin mounts. The projectile weight is about 1.6 pounds; rate of fire is 375 rounds/minute/barrel. They have a range of 9,400 meters and an effective range of 3,500 meters, with a 1600 round ready service capacity at each twin mount. While these weapons are obviously limited in range, at close quarters they would be extremely dangerous. In an earlier post I used the weight of projectiles a ship could shoot per minute as one measure of the possible effectiveness of a weapon system. By that measure four 37mm firing 375 one-point-six pound projectiles per minute would mean the capability of firing 2400 pounds of projectiles per minute. This is more than a single 57mm Mk110 (1160 pounds), a 76mm Mk75 (1120 pounds), or even a 5″/62 Mk45 mod4 (1400 pounds). Why did they retain all four mounts? It would not have been hard to remove two of the four mounts and still retain, what many would see as more than adequate law enforcement firepower, but we probably should not read too much into the retention of all four mounts; it was the easier option, and they may be seen as nothing more than on board spares. They certainly have retained a fierce capability to engage at anything less than 4,000 yards. I would not mind seeing similar redundancy on USCG cutters for our peacetime missions.. The deletion of the ASW equipment certainly suggest the new, more militarized, Chinese Coast Guard does not see itself as ASW capable, and the removal of the 100mm guns suggest they don’t expect to be used as a Naval Gun Fire Support asset. This entry was posted in China, Pacific, Ships, South China Sea by Chuck Hill. Bookmark the permalink. I suspect the Type 053H2G frigate will most likely try to be on par with the Hamilton class Cutters which are the standard for most Coast Guard’s around the world. These appear to be a good close match to the 378s. Similar in size, speed and capabilities. As a thought exercise, in the highly unlikely event of a straight up one on one fight between a Philippine 378 and one of these vessels, the Philippine ship should want to engage from outside the range of the 37mms (just over 10,000 yards) while the Chinese vessel should want to close range to about 4,000 yards or even less. The 378 has a theoretical speed advantage, but it cannot shoot from the bow mounted gun and simultaneously run directly away from the Chinese cutter. If the engagement starts with the 378 outside the range of the Chinese cutter, it might be possible to alternately run and shoot in the hope of slowing the Chinese cutter while staying out of its range. If the engagement opens with the 378 inside 10,000 yards, they should attempt to damage the Chinese cutter as quickly as possible while attempting to open the range or at least keep the range as long as possible for as long as possible. The greater the range, the more the advantage swings toward the 378 with its longer range weapon. On the subject of the Philippines 378’s. Have you’ve seen what they added. There has been talk of anti-ship cruise missiles but so far all I have seen is one ship with Mk38 mod2 25mm guns added. Still no air search radar and not CIWS. Remember what gets taken off can be put back on if need be. In Chinese eyes these ships were no longer first line. Their systems were largely obsolete. They probably felt building new ships, which they are doing at a very rapid rate, was preferable to upgrading these. The twin 100 mm guns in particular looked like something that might have been right at home on a British WWII destroyer. The AAW missile systems were also relatively crude. If they follow the soviet approach it would be. The hangar is big enough for the Harbin Z-9 helicopter which in technology terms is a generation or so beyond the ship itself. Wise to keep all 4 dual 37mm mounts. I would have kept the 100mm just for show…..
At this rate they will have more ships than we have missiles and torpedoes to sink ’em. We now know what at least one of these ships is doing. Photo here. Makes a good looking cutter.